Meat Loaf says it best: “if you are only killing time it will kill you right back.” How true. 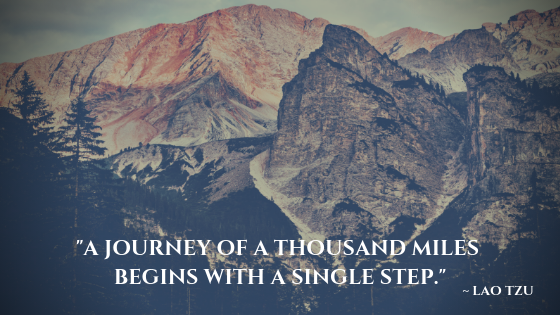 As we all try to cram more into our days, weeks, and nights we are creating unsustainable expectations for ourselves and for those that rely on each of us to get stuff done. In a previous post, Time “Savers” that Could Kill You, I offered my opinion on what I would consider dangerous and potentially life-threatening “time savers” that seem to be becoming commonplace in our manically productive world. Sleep deprivation, texting or emailing when driving, fast food and avoiding exercise were all on my list. I prioritize. What are your time priorities? If you answer “clearing my inbox, answering and responding to calls, getting projects done” then you have not looked at your life from the proverbial 30,000 feet. You are missing the big picture. Personally, my priorities (in order) are my health, my family, my career, and my personal development (yes, health comes first – without this the others are jeopardized!). So, my time spent always aligns with those. My health time includes sleeping, preparing healthy meals and exercising. My family time includes all that is involved in being a mother, wife, daughter, sister, cousin, grandchild, etc. My career is all that I do to manage my clients and business. And my personal development includes many of my social relationships, reading books and attending school, conferences and workshops. I make sure that every day includes at least one activity under each domain and recognize that some weeks my time shifts between these unevenly, but that in the next week I will find a way to correct course. Nothing I ever do under any of these priorities can be considered a “waste of time” as that would put me in a negative mindset (i.e. having to take a day off to manage a sick kid is never met with angst – “sick kid” falls under the family priority). Having set and firm priorities allows me to dictate how to schedule my time ensuring the right balance over a day, week and month between the four pillars of my life. I am proactive. Being reactive is a time waster. When we “react” we enter a different head-space, are required to shift our focus from the events of the day to something unplanned, and often spend more time picking up the pieces than we would if things didn’t crumble in the first place. Do you have a warning light on in your car? Get it into the shop before you are stranded at the side of the road spending hours dealing with roadside assistance and not having access to a vehicle. Or better yet, schedule your car for regular maintenance to keep it running smoothly. Feeling sluggish or unwell? Take a day off to recharge, make some changes to your routines, or get into your doctor before you enter full-blown illness. Taking one day off to feel better is more effective than the week you will need when the illness spreads. I use technology wisely. Technology is a tool, but it is also a trap. My phone has a few productive apps but no games. Personally, “playing video games” does not align with my priorities as these have nothing to do with my health, family, career or personal development. I also don’t use my phone to conduct business – more to just be informed about it. Trying to conduct business on a smartphone often leads to errors in typing, autocorrect, and changes the response to something shorter, even curt. I would prefer to respond on my computer or make a phone call versus emailing on a device. I also don’t watch TV – unless it involves a family movie or show we can all enjoy together. Technology for me is an information tool for my business, and an “in the moment” way to communicate, but otherwise I think use of those gadgets are a waste of time, not the opposite. I know myself. Are you in tune with your capacity? Personally, I know my limits and recognize when I work best. For example, I am most effective at writing (reports, documents, blogs, etc) in the morning. From 8am to noon I can fly through written tasks quickly. After noon, my focus wanes and it is easier for me to work on emails and calls as these require more short-term attention. This is how I try to structure my workdays. I also know things that I am good at, struggle with, and those things that I have taken on before with poor outcomes. Knowing this helps me to stay in my strengths as this is where I am most effective. I use lists. In “The Art of Stress Free Productivity” and even “The Four Hour Workweek” both authors suggested that each day should start with a list of the top 3-5 things that need to be done that day. No exceptions. I find this strategy exceptionally helpful and each morning, or even the night before, I write a short list of “to do’s” and enjoy crossing things off as I accomplish them. Sometimes the list is separated by “personal, kids, work” etc. to match my priorities. And if I find myself wandering from my list to other tasks (i.e. my email inbox), having this in front of me grounds me back to the tasks that need to come first. I take notes when reading. When I read educational or development books I always have a notepad and pen with me. Why? Because to read a book about personal development and to not take away or implement any of the strategies after makes reading a waste of time. If there is information I can benefit from, I want to capture that in a place where I can incorporate it into my life and review it later. This optimizes my reading time and self-development priority. I manage my energy levels. Maximizing my energy levels maximizes my productivity. I do this by eating well, sleeping well, managing stress, and exercising. I delegate. To effectively delegate you need to look at the resources available to you and determine who might be able to take some of the responsibility and run with it. If you know you don’t have time to take on a new project, say no, or figure out who you can enlist to support you in getting the job done. I practice self-discipline. It is easy to be distracted, coerced, or tempted by other, maybe more fun, but usually less productive, tasks. That phone conversation with a friend, google wandering, checking Facebook, that lengthy lunch. While these may ultimately align with your priorities, the things you are neglecting during your productive hiatus will only work to move things from “important” to “urgent” in no time. Self-discipline allows you to firmly focus on the tasks on your “to-do” list versus those other enjoyable activities that might sway you in a less productive direction. So, get the “to dos” done first before being pulled in other directions. 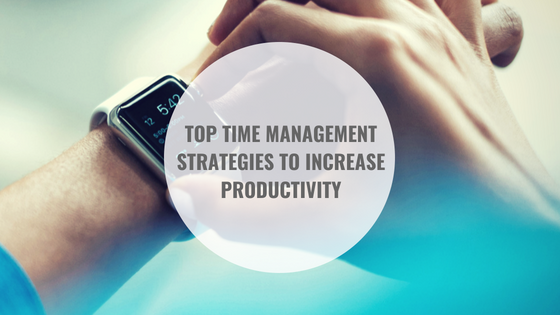 Do you have other time maximizing ideas? I would love to hear them. In 2011, Statistics Canada reported that 5.9% of full-time employees were absent from work due to illness or disability. The costs associated with workplace injuries are vast. Studies have shown that the duration of work disability, as well as costs, are significantly reduced when the workplace has contact with a health care provider coordinating return to work interventions. In fact, well-designed return to work programs are now recognized as the best practice to reduce costs associated with worker’s compensation. Occupational therapy is a cost-effective strategy to accelerate the client’s recovery and rate of returning to work. 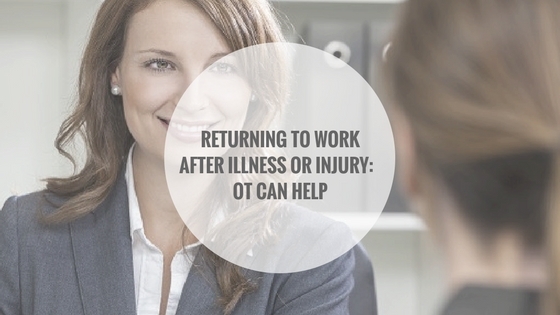 With an effective return to work plan coordinated by an occupational therapist, injured or ill employees can recover quicker and return to work faster, significantly reducing employer costs associated with workplace injuries. In the following video from our OT-V series, we will discuss how occupational therapists can help to support the critical transition back to the workplace following an interruption of work duties due to physical or mental health issues. For more information on promoting employee wellness in the workplace visit our Healthy Workplace blog page. This week’s O-Tip of the Week focuses on ways to get you moving throughout the day in order to keep a healthy lifestyle and prevent sitting disease. 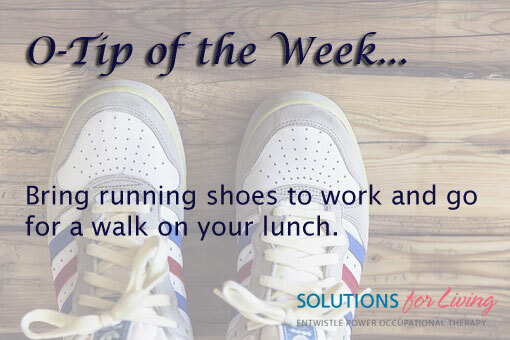 Bring a pair of running shoes with you to work and take a walk on your lunch and/or breaks. Walking is great for cardiovascular and bone health and will help to prevent the negative effects of sitting all day. Learn more ways to combat the negative effects of sitting disease in our post, Solutions to Stop Sitting Disease. While minor accidents are common in the workplace and quickly addressed, higher instances of stress, mental illness, and workplace bullying are being seen across all industries. If you are suffering where do you go to get help? If you see signs of mental distress in a fellow employee, how can you help? The following from The Globe and Mail discusses how and where to seek help if you are concerned. Humans are not made for immobility. Even if you take a healthy joint and put it in a cast for even a few days, when you remove this the movement of the joint will be decreased, pain will appear, and muscles that surround the joint will have started to atrophy. So, how does this translate to jobs that require us to sit all day, being immobile at a computer, in a car, or at a desk? It’s important for your physical and mental health to involve frequent movement into your day. Not only will this help you combat the negative effects of “sitting disease,” it can help you to become more productive. 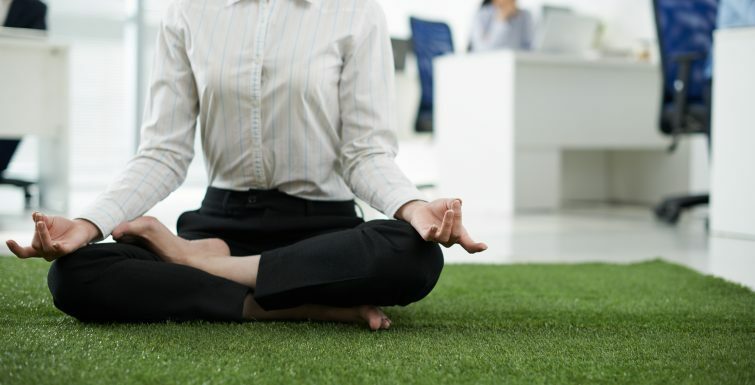 Take a look at the following from Positive Health Wellness for some tips and simple stretches to incorporate into your work day. 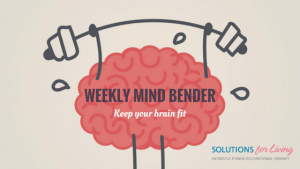 When it comes to health and safety in the workplace, we are often quick to think of work-related musculoskeletal disorders and other physical injuries, but just as with health in general, we also need to make mental health in the workplace a priority. Nearly half of all Canadians experience some form of mental health concerns at work. Mental health issues are the number one cause of short term and long term disability leave. The following video from our OT-V series discusses the ways an Occupational Therapist can work with employees, employers and medical teams to help employees overcome mental health stressors at work in order to be more productive and miss less time from work. I have several commutes. If I bring my laptop home, one commute is to my dining room table. If I leave my laptop at the office, I have a seven-minute drive (eight in traffic) before I am sitting at my desk. If I am required to be in Toronto for 8:30am, my commute starts at 6:00am for a drive that in “good traffic” would only take me 50 minutes. With more and more people living away from work so they can afford more sizable housing, more property, or even perhaps a desire or need to stay close to extended family and child care, Flexible Work Schedules are becoming more valued, and dare I say, necessary. 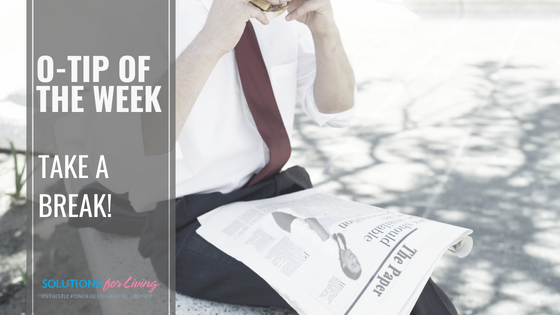 Flexible work schedules are arrangements that allow employees the opportunity to better juggle their family and personal responsibilities that typically conflict with the traditional Monday-to-Friday, 9-to-5 work week. 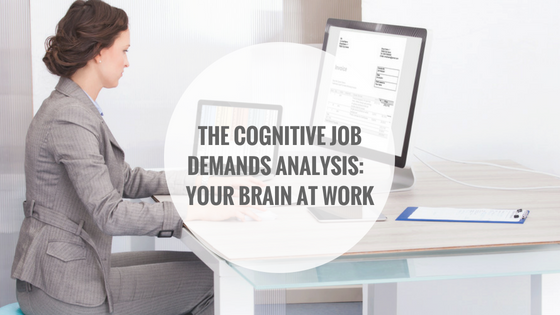 These arrangements can take several forms, including: working a set number of hours with flexible and agreed upon start and end times, working longer days in exchange for a day off, or requesting time off for personal reasons and offering to make it up by working longer hours on another day. According to Statistics Canada, in 2014 69% of couple families with at least one child were dual-earner families, representing quite an increase from 36% in 1976. As the number of dual-earner families continues to rise, the option of flexible work schedules will become increasingly enticing for such families who struggle to get their kids on the school bus in time for their lengthy commute. In 2012, an estimated 36% of Canadian employees with caregiving responsibilities had flexible hours, and this value will likely continue to rise. As they say, times have changed, and this seems to be a change for the better. Canada’s 2012 General Social Survey reports that having a flexible schedule that allows employees to choose when their work day starts and ends was associated with slightly greater satisfaction. In fact, 79% of employees with a flexible work schedule reported that they were satisfied or very satisfied with their work–life balance, compared to 73% of those whose schedule was not flexible. More specifically, studies that have explored the benefits of flexible work schedules for employees suggest that they improve overall work-life balance, reduce workplace stress and health-related symptoms, and increase job satisfaction and organizational commitment, ultimately maintaining their connection to the labor market. These advantages go both ways, as these arrangements benefit employers by enhancing recruitment and retention, reducing absenteeism, and increasing productivity, naturally leading to reduced costs. So what does this shift towards flexible work options mean for you if you have a disability, and me as an occupational therapist? If you need to return to work following injury or illness, an occupational therapist is well-equipped to help you and your employer devise workplace accommodations to gradually resume your full-time duties, and flexible hours makes this transition more feasible and likely to be successful. 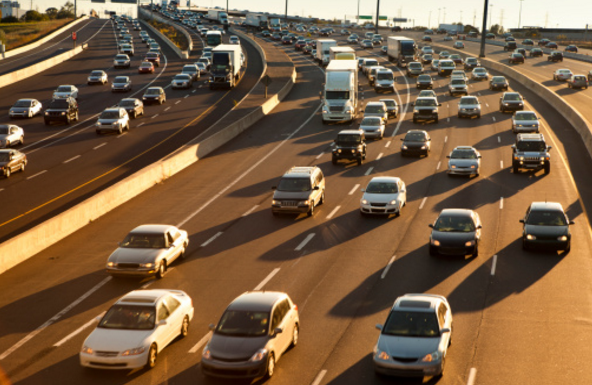 For example, if sitting for long periods is challenging, but sitting is a necessary part of your job, then we don’t want your “sitting clock” to be “ticking” while you are stuck in traffic. If flexible work hours can get you at your desk faster, allowing you more time to work and less time to aggravate your symptoms in the car, then a supportive employer should see the benefit of that – for you and them. Also, if as part of your recovery you continue to require medical oversight or treatment by other providers, a flexible work schedule will allow you the freedom to maintain your treatment schedule, while still gradually resuming job duties. If flexible work hours can benefit both employer and employee, both within and outside of a rehabilitation process, then I say “just ask for it”….and work with your employer to develop a program and schedule that works for both of you.